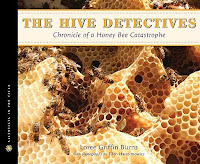 The Hive Detectives: Chronicle of a Honey Bee Catastrophe by Loree Griffin Burns. Grades 4-7. Houghton Mifflin Books for Children, May 2010. Review copy provided by publisher. So, Travis of 100 Scope Notes is hosting Nonfiction Monday today and he threw down the gauntlet by declaring this Nontraditional Nonfiction Monday and challenging us to create reviews that are a little out of the ordinary. I had a bunch of ideas, but in the end I decided that you're going to have to work a little bit for this review. I give you The Hive Detectives: A Crossword Puzzle Review. And in case you get stuck, here's the answer key. The Hive Detectives is on shelves now! I can't wait to "read" this review tonight (too early in the day to get caught in a crossword puzzle). Just the thought makes me smile. I read and loved The Hive Detectives, which made me feel thankful for the bees doing their work now among the iris as I write on the porch. What a neat idea, Abby. Thanks for sharing this excellent, non-traditional, outside-the-box, crossword puzzle review of THE HIVE DETECTIVES! This is awesome! What a great way to add some "creative" to literacy. This is unbelievable. Man. Great job. Thanks for taking part!